There are two kinds of video subtitles. One is soft subtitles, the other is hard subtitles. Hard subtitles is burned to video permanently and cannot be switch on/off. It’s safe for any media player and you decide how the subtitles looks like exactly, for example, the position, size, font, color, background etc. But there is slightly quality loss adding subtitles to video permanently. 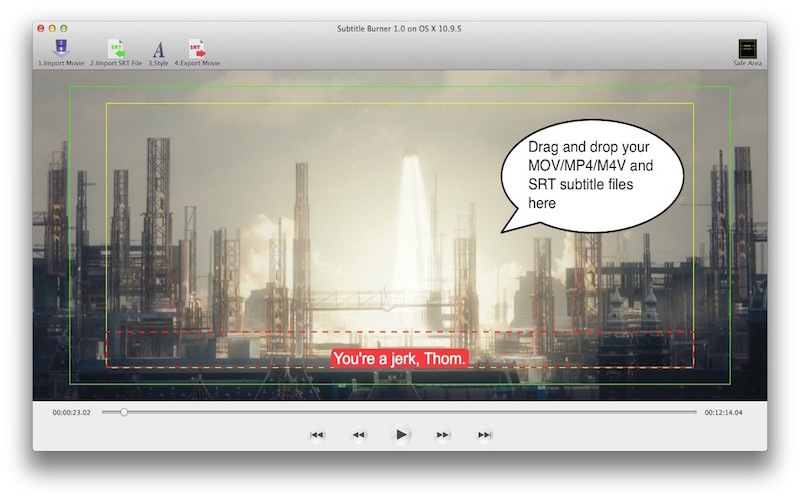 Subtitle Burner is a tool to burn hard subtitles to your videos on Mac. –Only Mov, MP4, M4V videos are supported so far. DRM M4V is not supported. –SRT subtitle file supported only. You can download SRT Converter to convert subtitle to SRT format. 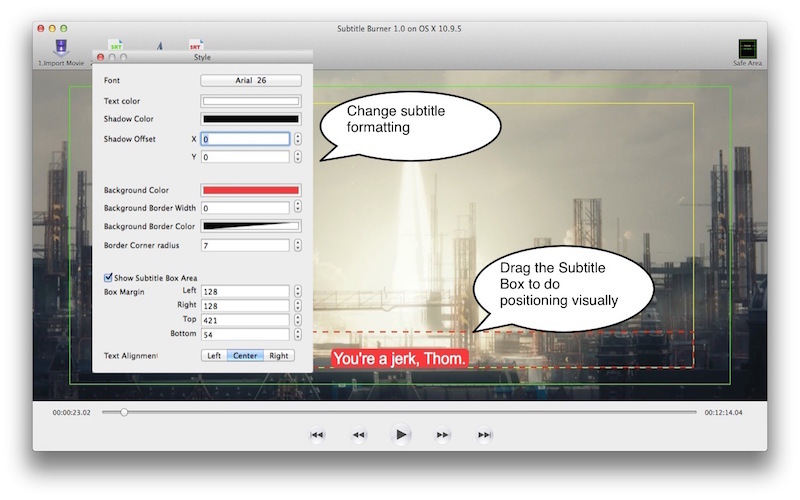 –Visually drag subtitle box to do positioning. –Font, size, color, position, outline, background box settings. –Support all languages of subtitles on Mac. –If you want soft subtitles, please download Subtitle Writer. –If you want to import subtitles to Final Cut Pro, please download Final SRT. –If you want to import subtitles to Adobe Premiere Pro CC, please download Premiere SRT. –If you want to batch upload videos to YouTube, please download Batch Uploader for YouTube. 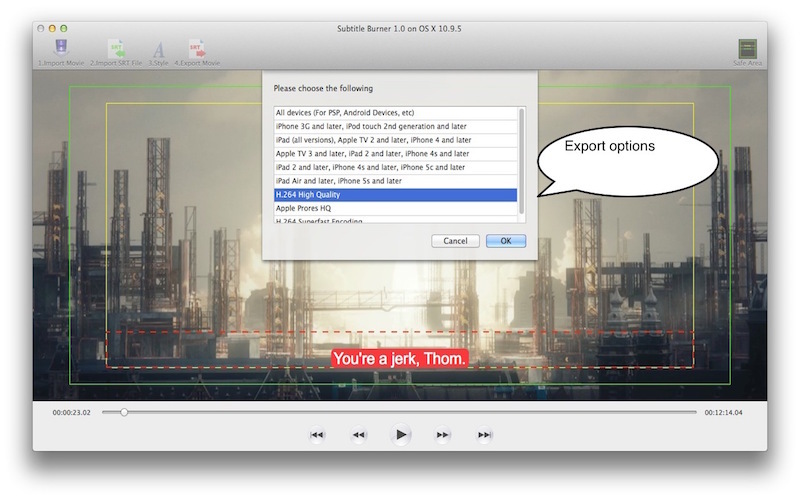 –If you want to extract soft subtitles from video, please download SRT Extractor. This entry was posted in FinalSub News and tagged add, burn, burner, caption, captions, hard, hardcoded, mac, mac os, movie, os x, osx, soft, srt, subtitle, subtitles, video, write, writer. Bookmark the permalink.